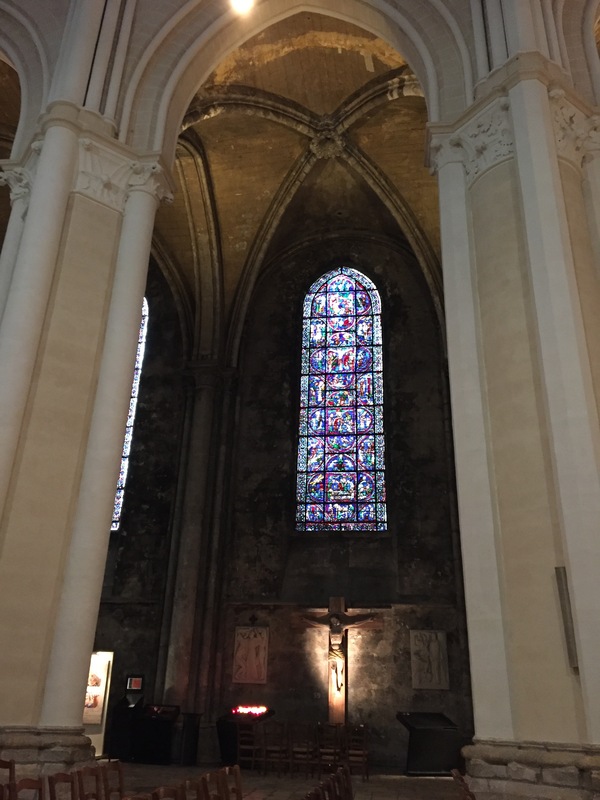 We are in Chartres to work on an amazing project which I am so grateful to have a chance to participate in – but by Saturday I was exhausted. Our weekend started Sunday. 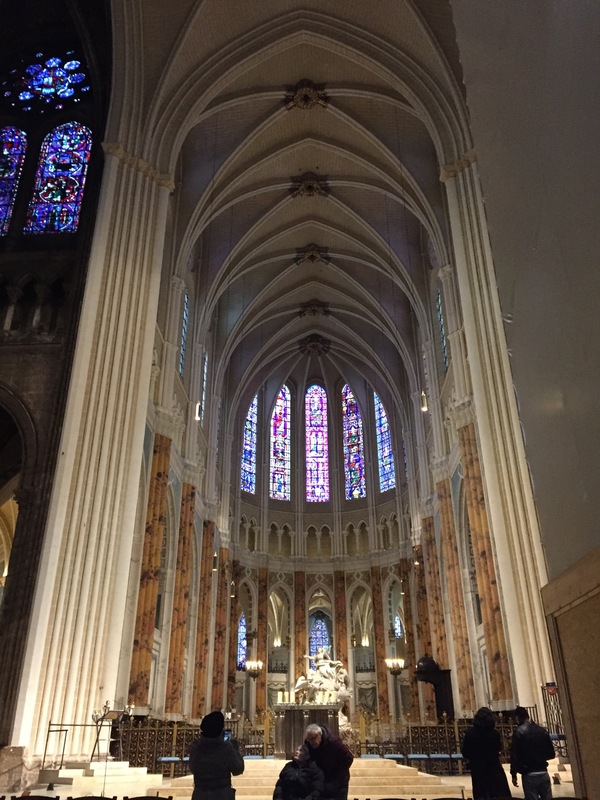 We were lucky enough to get a private tour of the cathedral. Malcom Miller literally wrote the book on the subject, and since the 1980’s ( at least) has been leading tours around the cathedral. Mr. Miller is an older British ex-pat who has a rather exhaustive knowledge on the church. As he accurately pointed out, an hour and a half tour was barely enough to talk about a selection of the stained glass windows and if we had a month of 1.5 hour tours that would not be enough to cover all of the church. The tour started with the windows on the west wall which date from the romanesque church preceding the current cathedral. The “new doors” and the window above them dates from the 1100s and is the only surviving wall from the earlier church. The rest of the preceding cathedral burnt down in a fire. This surviving wall determined the boundary of the new gothic cathedral. A ledge between the tall windows and the rose window above marks the original height of the earlier church. The pointed arches of the Gothic cathedral distribute the architectural weight differently in a way which allows the church to reach new heights. 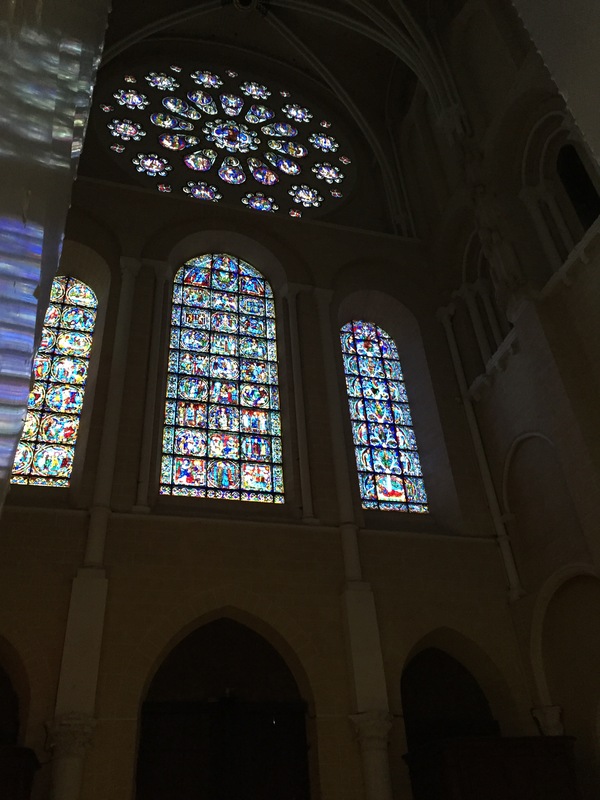 Stained glass windows are insanely expensive, and so medieval Chartres started essentially a royal kick starter to fund the windows in the new church. 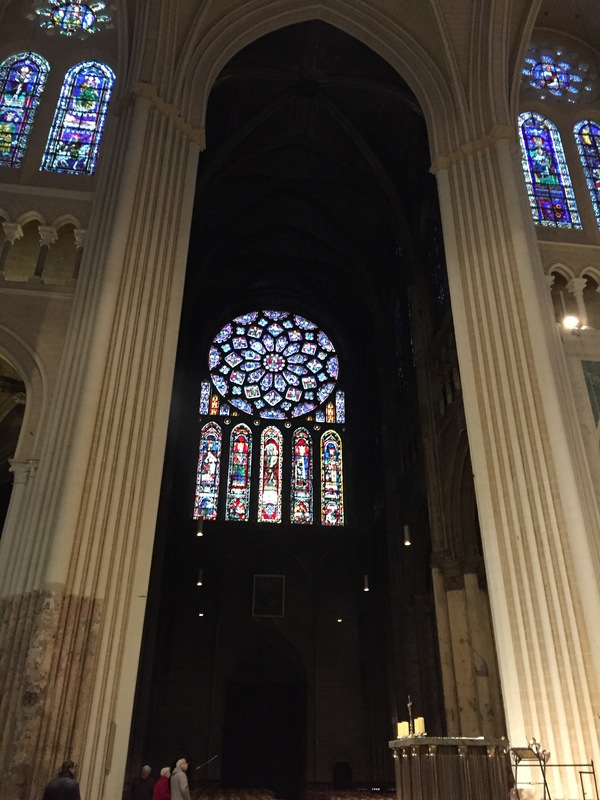 Blanche of Castile funded this window. This incredible queen was the granddaughter of Elanor of Aquitaine, and acted as regent in her own right as queen of France. Her royal symbols can be seen in the small windows underneath the rose window. The heraldry depicts the yellow castle on a red background for castile and the fleur de lis that marks her as queen of France. The remaining windows which we looked at contained everything from shoemakers to a medieval depiction of the phrase on google scholar “we stand on the shoulders’ of giants”. The thread that wound through all the windows was the startling and wonderful shade of blue.